Dog's destructive behavior can vary from chewing on the cushion to scratching the carpet, and sometimes completely tear the sofa to pieces. I've heard of puppies chewing through the board's dividers. Apart from the debris and stress, any destruction in the house can affect your bank balance, which is the main reason to get this behavior problem under control. All dogs have the potential to cause destruction. Chewing is in their nature and recognizing the major causes of this destructive behavior is the first step to remedy the situation. 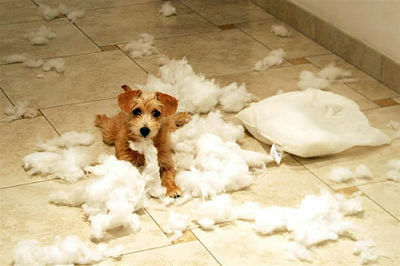 The following are the causes and possible ways of discouraging dogs destructive behavior. Boredom: This is often the major reason for dog’s destructive tendencies. Dogs are a social animal in nature and if left alone for a long period of time, they will likely get bored, and most dogs will deal with boredom by chewing on items. Stress: This is another justification for this destructive conduct. Similar to people, dogs can become stressed and like people, they handle stress in different ways. One way dogs calm stress is to chew. Other signs of stress may include constant bark and uncontrolled urination. Fear: Fear can also be another reason why dog chews on items; Puppies can easily be astonished by loud noises, fireworks, and sirens. Some dog can be nervous of visitors or other dogs. Even dogs that are generally quiet can become destructive when they are afraid. Instincts: In addition, instincts can be another reason dogs chew on items, mostly puppies. Dog chewing is a way to explore the world around them. The Puppies chew because they are cutting their teeth and they need something to make their gums feel better. One of the ways you can discourage chewing is by ensuring there are enough approved entertainment toys to keep them occupied. Provide some fun chewing toys and enduring dog treats for your dog to enjoy while you are away. Give him few things to play with at the same time. You may also consider a treat dispenser. Identify stressful situations for your dog early and prepared them. For instance, if your personal work schedule is changing, endeavor setting up your puppy by leaving for short periods of time per week or earlier. Slowly, making that change in routine can help your dog adjust. Ensure to establish a place to keep your dog away from noise disturbance during holidays such as 4th July or New Year Eve and family gatherings, providing your dog a restricted space like a kennel, using an anxiety wrap or calming supplement can help. Lastly, control your dog when you are at home. Constantly correct destructive behavior when it happens. When you observed that your dog is going to chew on items he should not, make a loud clap and say leave it. Then replace unsuitable chewing items with one of your dogs chew toys. This corrective technique will instruct your dog quickly that his toys are approved and chewing on something else means trouble.